Syncfusion Excel (XlsIO) library is a .NET Excel library used to create, read, and edit Excel documents. Also, converts Excel documents to PDF files. Using this library, you can load data from Excel to DataGrid or DataGridView in C#. 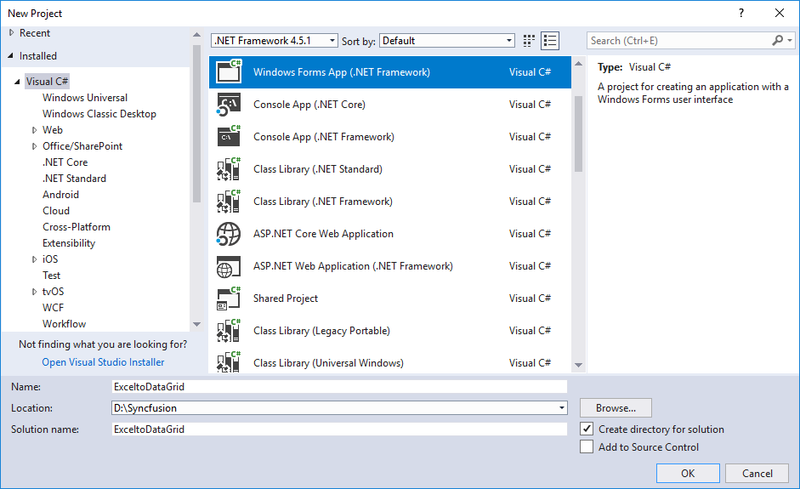 Step 1: Create a new Windows Forms application project. 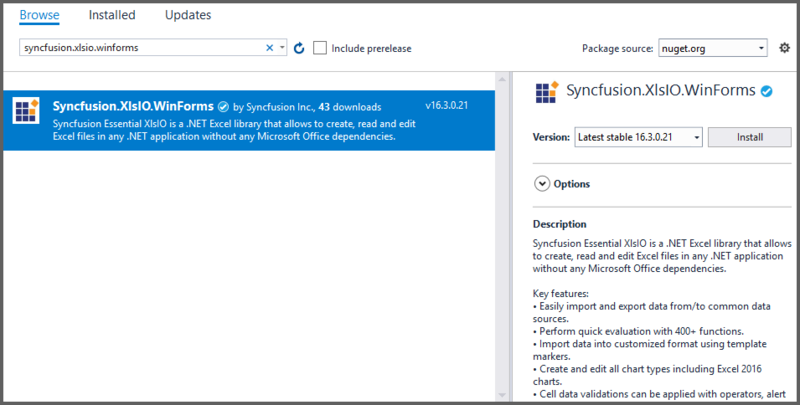 Step 2: Install the Syncfusion.XlsIO.WinForms NuGet package as reference to your .NET Framework application from NuGet.org. Step 3: Include the following namespaces in the Program.cs file for DataGrid and XlsIO usage. Step 4: Add the DataGrid control in Form1.cs. 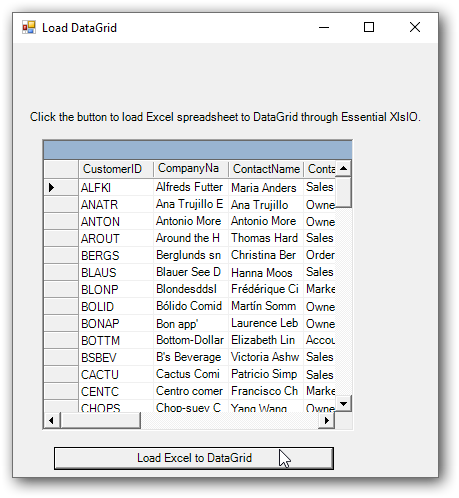 Step 5: Add a new button to load data from Excel file to DataGrid. btnImport.Text = "Load Excel to DataGrid"
label.Text = "Click the button to load Excel spreadsheet to DataGrid through Essential XlsIO." Step 6: Use the following code snippet to load the Excel workbook. //Set default version for application. //No exception will be thrown if there are unsaved workbooks. 'Set default version for application. 'No exception will be thrown if there are unsaved workbooks. Step 7: Export the Excel sheet data to a DataTable using ExportDataTable() method. Step 8: Load the exported DataTable to DataGrid object by setting DataSource property. Step 9: Use the following code to load data from Excel to DataGrid or DataGridView in C# and VB.NET, using XlsIO. //Export data from Excel worksheet. A complete Windows Forms working example of how to load data from the input Excel to DataGrid or DataGridView in C# can be downloaded from Excel to DataGrid or DataGridView.zip. How to export DataTable with images to Excel in C#, VB.NET? How to preserve data types during ImportDataTable in C#, VB.NET?